It was good to hear that the family of swans that bred on the dead arm of the canal in Alvechurch have been seen here again, all safe and well. They disappeared a couple of days after the cygnets were hatched, but we needn’t have worried. This pair was one of the wife-swapping quartet earlier in the year, and carries the leg-tags 40D and YYG. I enjoyed the display of flowers planted by Alvechurch Village Society by the station, which looked lovely in late July and early August. They are mostly annual flowers which grow on arable land, and many weren’t native varieties, so I’m not sure if they will come again next year. But the native wild carrot and yarrow around them, and the tansy on the platform bank, carried on flowering right through to September so we had continuous bloom there – great for bees and butterflies. In the summer I spent some time on the Isle of Islay in the Inner Hebrides. It’s a fascinating place, not least because of its eight whisky distilleries. Forty years ago the island had suffered like all remote rural areas from depopulation; many places were derelict and some distilleries closed. However, the distilleries have become productive again, with a new one opening ten years ago, and this and the associated tourist trade has had the effect of revitalising the island. While I was expecting the eight distilleries on one tiny island, I didn’t realise that each one produced many different “single malts” – the really good local whisky – as well as most of them exporting whisky for the blends produced by the bigger companies. Some of these single malts (way outside my price range) are sourced from particular fields on particular farms, even from specific barley varieties. he one nearest us also produced some of its malts only from local barley from chosen farms. So, you could see the barley waving in the fields and know where it was going. I grew up on a farm which specialised in barley, though this was for cattle, not whisky. 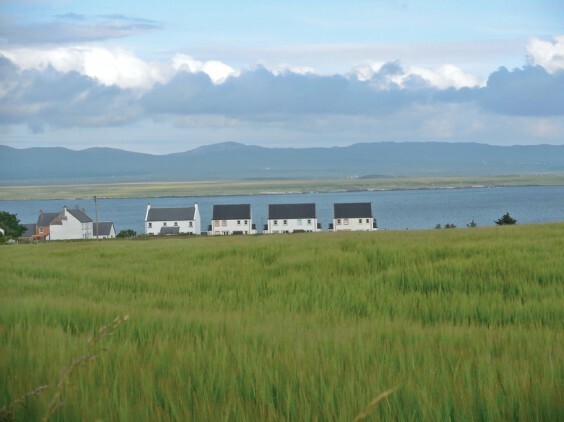 I can still recognise the smell of a field of barley before I see it, and this happened on Islay (above). This time I realised that the barley already smells of the beer or whisky it will become – that distinctive malt smell. The whisky is also flavoured by peat smoke, giving it its local characteristic taste. Peat is of course a big resource still on these remote islands, and is the common fuel for fires and stoves. Barley is a crop which used to be a staple for human food but these days is mostly used for animal feed. It grows in less favourable areas, so does well in the Highlands and Islands. Most people would have eaten barley bread as their usual loaf in the past. Oats also grow well in those colder climes, and oatcakes were a common substitute for bread, still made in that area. Our ancestors ate quite a variety of different grains, including older varieties of wheat such as spelt and einkorn, as well as oats, barley and rye. A significant thing about these is they are lower in gluten that modern wheat – and of course the whole grain would be used – so they were healthy foods. The distillery near where we stayed also produced a local gin featuring “botanicals” from a range of wild flowers. Most of these were local but a few had been planted specially. The flowers included tansy, mugwort, mint and meadowsweet – I won’t go through the whole list! The key ingredient of gin, juniper, does grow on Islay but is rare now, so they only use a tiny token bit of that and import the rest. But the process reflects on how diverse and lovely the wildflowers on this island are. There is also an excellent local brewery, making beers using the same barley that goes into the whisky. I had expected Islay to be rather barren, but far from it. Roadside verges, sea cliffs and dunes were all crowded with flowers. We saw orchids, sneezewort, meadow cranesbill, ladies’ bedstraw, harebell, thyme, heather, stonecrop and ragged robin among dozens of flowers by the roadside. There was lots of eyebright, a pretty little flower we don’t get here. They did mow a narrow strip along the roadside – important on such a narrow road so you could walk along it – but left a good wide verge for flowers to grow. On the dunes were storksbill, pink pimpernel, more orchids and a quite rare plant called grass of Parnassus. This I have only ever seen in Scotland, and that was forty years ago! While we were there, a brief spell of good weather meant that the roads were full of farm traffic as the hay fields were harvested in a hurry. It must be the same later in the summer when the precious barley is harvested. Both crops looked very good. Other fields were full of cattle (though the creamery closed down a while ago) and sheep, and even alpacas. The island is not as self-sufficient as Mull, which I visited a few years ago, and which has pretty well everything – its own cheese farm, bakery, smokery and even chocolate factory! On Islay you can’t buy bread till after the first ferry has come in. It still has working fishing boats though, and the presence of the distilleries means that, unusually, there is work to keep young men on the island. At home in Withybed they were harvesting hay too. My local farmer has regenerated the fields round here, which used to be more or less just grass and buttercups. Now they have a variety of flowers – clovers, hayrattle, vetches, stitchwort, even a few orchids – and the resulting hay is much more diverse. It is only common sense that hay with a mixture of herbs and flowers has far more nutrients than pure grass. Certainly it produces excellent longhorn beef! Back on Islay, as well as the flowers, there is abundant bird life, and animals like otters and seals. I especially liked watching wheatears and stonechats, which I don’t see round here, and we marvelled at how they manage not to land on the electric fences along the roadside! Among the water-birds were black-backed gulls and oyster-catchers. The seals were fascinating, especially in the harbour at Portnahaven, where you could hear their strange, rather mournful cries as they wallowed in the shallow water. An otter ran across the road in front of us as we were driving to the ferry, nearly causing an accident, but looking beautiful. I was thinking about this island full of drinkable and edible things when I went over to see how things were going at the Lime Kilns site in Tardebigge. You may remember this is where volunteers from the Worcester-Birmingham and Droitwich Canal Society have uncovered an old orchard. Last year we found apple, plum and damson trees. Early this year we discovered a grape vine growing along an old brick wall, and a gooseberry bush. Recently I found a large patch of hops spreading up a bank. Hops grow wild but it may have been planted as Worcestershire and Herefordshire were big hop-producing counties. There is one near Alvechurch station and you often find them in hedges. In Worcester there is an old building called the Hop Market, and I guess there was a good trade in them at one time. All along the path leading on to the Lime Kilns site are the huge leaves of horseradish. So what with all these and the elder trees, there is potential for rather a lot of food and drink. And if you don’t want alcohol, there are both dandelion and burdock to make a soft drink. We seem to have lost the ability to make use of growing things in our food and drinks. Hops were not the only plant used for flavouring beer. Nettles were commonly used. A small plant with a purple flower called ground-ivy was very much in demand for beer – its alternative name is ale-hoof. Meadowsweet was used too, both for beer and for mead, a fermented honey drink. All of these plants carry bitter elements. Elder and other berry-bearing bushes like blackthorn were used for wine and to make liqueurs with spirits like gin. The five apple trees on the site are fruiting really well this year. Apples make cider, of course. This area round Tardebigge was renowned for it. For most country people this was their everyday drink, not especially strong and made from whatever apples were to hand. I remember the next farm to us, when I was a child, always had a cider-barrel on the go in the loft, accessible to children as well as adults! The grapevine at Tardebigge hasn’t borne any grapes this year, and I suspect it used to be kept behind glass. Grapes can ripen in this part of the world, though, especially in a good summer. The Romans brought grapes over and produced wine here, in a mild age, and there is a big revival in modern times. Vines Park in Droitwich was named after a Roman vineyard. But of course country people have made wine for centuries from almost everything that grows – dandelion, elder, parsnips, for example. As long as there are sugars which will turn to alcohol and an interesting flavour, it could become wine. In the days when drinking water was unreliable, and especially before tea and coffee were imported, cider, beer and wine were everyone’s everyday drink. September is a good time to pick wild fruit for wine, flavoured gin – or of course jam if you don’t want to drink them. They are ripening quite late this year, after a cool spring and early summer, but most crops look quite good, especially crab-apples. Make sure you know what you are picking, though! Uncovered into blossom and fruit. Last year with the nettles, but saved this year. Was a hop, spreading wide on trees and bank. Even dandelion and burdock for the children. Making me a little drunk as I walk around it.